When it comes to spirits or alcoholic beverages, there’s variety not only in types or forms but also in how whiskey, rum, vodka or beer is produced and stored. Talking about the storage part, many alcohol enthusiasts and spirit connoisseurs nurse the impression that beers, unlike wines or whiskeys, do not need to be aged in beer storage containers like casks or barrels. Of course, some beer types, ales, and lagers can be quaffed off straight from the bottle or can which has arrived from the brewery shortly. However, there are many beer varieties that need to sit in growlers, barrels, cans, and glass bottles for some time before you can savor them. Beer variants, especially those with relatively high ABV (alcohol by volume) like dark lagers, German bocks, brown ales, porters, and IPAs release a potpourri of flavors when aged in containers. Ale and lager brewers and producers have numerous options for packaging their produce-cans, kegs, growlers, bags, and pouches. Spirits purists will simply cry foul if they’re told that beer could be packaged and preserved in plastic containers. And though it sounds like ‘Ripley’s Believe it or Not’, many US-based breweries are bottling beers in plastic containers manufactured by All American Containers. In this blog, we outline and enumerate on the different kinds of beer storage containers that brewers use for preserving their brew. No matter in which kind of container you transfer the brew (beer) to, make sure you keep the bottle, growler or keg in a cool and dark place. Always ensure that the beer storage containers are kept away from sunlight or artificial light from bulbs and lamps. Light, artificial or natural interacts, with the acids in beers that could impart a skunky or sulfuric type odor to the ales. Also see to it that the concoction ages in an environment where the temperature always remains between 50˚F-55˚F. This temperature range is the ideal cellaring temperature. Pilsners, hops-based lagers, and pale ales are best preserved at this temperature spectrum while stronger varieties do fine at room temperature. Finally, see to it that the cellar or storehouse (where the produce is parked before dispatch) remains fairly cool in summer and moderately warm in winter. Coming to glass bottles, swigging lager from bottles is undoubtedly the most popular method of drinking. Many brewers (including Heineken and Anheuser-Busch InBev) on a worldwide basis always have and continue to can the bulk of their products in glass bottles of different shapes and sizes. Bottles, like cans or growlers, have their distinct advantages and drawbacks for beer storage. A glass bottle tends to be very steady i.e. it’s unlikely to topple or tumble if you place it on a plane or flat surface. Also, the narrow neck of the bottle prevents the brew from spilling out from the sides. 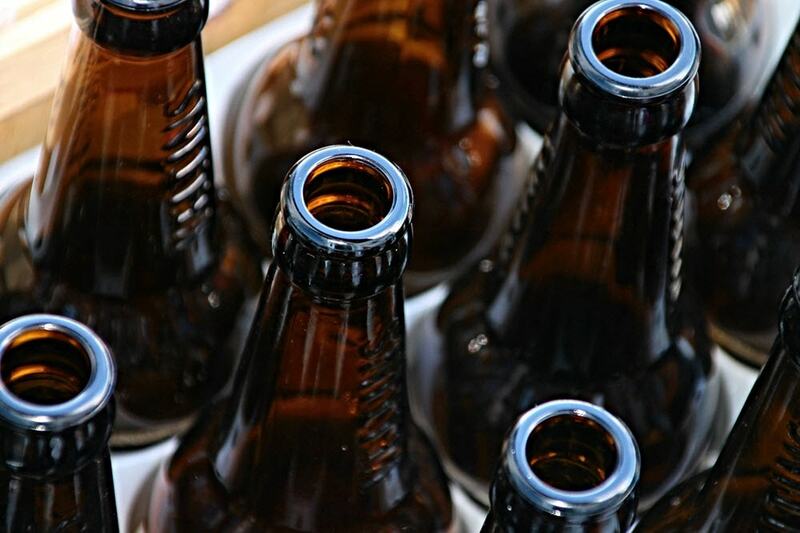 Bottles can be easily sanitized or sterilized which helps in retaining the lager’s original and unique flavors. Additionally, bottles can be perfectly topped and corked for making them withstand the high internal pressure which results from the action of a carbonated brew. Since glass is a bad conductor of heat and cold, it takes more time to cool them down but it also stays chilled longer in comparison to cans. However, the translucency or transparency of glass which ordinarily is its most versatile attribute becomes a disadvantage in this context. The lucidity of glass enables light rays to pass through the bottle effortlessly. Hence, brewers use brown, black, and dark amber colored bottles for minimizing ‘light strike’ effects. Aesthetically speaking, the packaging of glass bottles appears more chic and cool than aluminum cans. Perhaps, the only conspicuous shortcoming of this kind of container is that it is somewhat hefty. The heaviness of glass also poses problems for packaging, making bottles quite inconvenient to lug or transport. At the same time, recycling glass is difficult as the material is not eco-friendly. A growler is another reliable beer storage option for a good number of brewers around the world. In case you’re not aware of what a growler is, it is one type of urn or container normally used for storing draught beer and transporting the same. You surely must have seen those massive kegs in breweries (and in bars also) where the producer keeps a portion of his produce in the growler for offering to tasters and visitors who come calling. The growler comes with a tap at the front that needs to be turned for delivering the brew. Growlers have rubberized caps for hermetically sealing the containers which is essential for preserving the flavors and freshness. Why is a growler so-called? The expression may have originated in the 19th century when drinkers took beer home (from inns and pubs) in buckets with lids. The beer made a rumbling sound due to the production of bubbles and sometimes customers complained or grumbled while walking back home because the brewer had offered less than the due. And that is how the name growler stuck. You’ll enjoy drinking draught beer sourced from a growler provided the container stays chilled and sealed. Beer stored inside a growler tends to stay soothing and fresh for a long time, sometimes for months. However, to preserve the carbonation (and thus prevent oxidation), you’ll have to find a way of infusing or injecting carbon dioxide into the container. These days, you’ll come across growlers made of stainless steel complete with a sealing cap also chiseled out of steel. The stainless steel cap comes with an ‘O’ ring which locks-in and stems the pressure of the fizzy brew. The benefits of using a steel growler for you are numerous-you can take home the brew in a pristine state, decant it in a glass and quaff it off, put the cap back, and continue enjoying your aperitifs for the next 5-6 days with the carbonation intact. Also, stainless steel does not allow light (from any source) to infiltrate the growlers. The most glaring downside of growlers, regardless of whether they’re glassy, stainless steel or ceramic, is that they’re prone to make the brew go flat once they’re opened. Oxidation sets in the moment the keg is opened (and not capped back) while carbon dioxide escapes out, making the beer lose its fizz in a couple of days. Another noticeable drawback of a growler is that it is not at all portable-a standard keg filled with beer weighs at least 72.5kg (160 pounds). Kegs, very much like growlers, can be quickly filled up, simple to clean and maintain, thwarts oxidation, and serve as excellent secondary fermentors. No wonder, many brewers throughout the world prefer beer storage in kegs for canning and preserving ales, lagers, and stouts. Storing beer in kegs also offers multiple benefits for the end-user or drinker. Kegs sit pretty inside the fridge that eventually helps keep the yeasted sediment steady after settling down. So, you get to taste beer or lager whose carbonation remains intact for days after you first opened the keg. Kegs not only allow you to adjust, set, and hold onto the brew’s carbonation for a reasonably long time but also let you deal with over-carbonation. Kegs also stay cool better than bottles and decanting the beer from a keg to bottles or cans is easier as well. However, kegs score abysmally low on the portability factor but kegerators can help you keep them cold and out the way. The can is the beer storage container of choice for a large number of brewers producing a particular type of beer or specific varieties of ales, for a good number of reasons. For a start, cans being thoroughly solid and opaque, prevent sunlight from sneaking in. Breweries producing IPAs (Indian pale ale), malts and hops-styled lagers use cans on an extensive basis. Hop based beers and pale ales can easily and rapidly deteriorate, and develop a nasty flavor if exposed to sunlight. The second reason why such brewers take advantage of cans is purely economic-packaging beer in cans is cheaper than storing the brew in glass bottles or kegs. Finally, cans tend to be lighter making them easier to transport and store. From the perspective of the consumer, cans can be opened easily (no need for an opener), can be carted easily in a cool keg, and tend to be hardy. However, a good proportion of beer guzzlers have reported that the brew tastes somewhat different when sipped or swilled from an aluminum can. Nevertheless, there is no scientific evidence to back up the above claim. Last but not least, cans tend to be remarkably eco-friendly.